Colin Murphy reports on his visits to the Polisario-run camps, in Algeria, some years ago and more recently where roughly 100,000 people live a barren existence, without a functioning economy or proper services. This entry was posted in General, Political issues on November 22, 2015 by appleton. 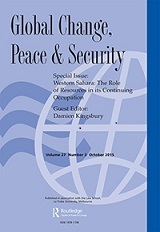 Global Change, Peace & Security, Special Issue: Western Sahara: The Role of Resources in its Continuing Occupation (Issue 27(3), October 2015). To read about the right to self-determination, political and socio-economic factors that may inhibit its exercise, and the possible consequences of failure to give effect to that right in the context of the Saharawis of Western Sahara and Morocco’s exploitation of Saharawi natural resources, see this latest issue. The journal is published by Routledge in association with La Trobe Law School. This entry was posted in Fisheries exploitation, Oil and gas exploration, Phosphate importation, Political issues on November 22, 2015 by appleton. (Washington, DC)…Human rights activists, including representatives of the US-Western Sahara Foundation, Nonviolent International, Sahrawi refugees and a former MINURSO official, gathered at the Embassy of Morocco Friday, November 6 at 10 am to submit a petition demanding that King Mohamed VI of Morocco stop obstructing the UN planned referendum over Western Sahara or withdraw from their illegal occupation of Western Sahara. This entry was posted in Political issues on November 22, 2015 by appleton. Forty years ago today (6 November), Morocco invaded Western Sahara, a former Spanish colonial possession – mostly made up of desert – in West Africa. 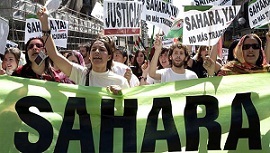 The letter initiated by the Western Sahara Campaign UK has been published in the Guardian online and in print on 5 November 2015 and has been signed by a number of support groups for Western Sahara from around the world. This entry was posted in General, Human Rights, Political issues on November 6, 2015 by appleton. This entry was posted in General, Political issues on November 6, 2015 by appleton. TINDOUF, Algeria – Heavy rains have been pounding much of North Africa and Middle East, bringing destruction in their wake and causing heavy flooding, but the torrential downpours have taken a particularly heavy toll on the vulnerable refugee community in Algeria’s Tindouf province. This entry was posted in General on November 1, 2015 by appleton.